I’m always on the hunt for unique children’s items. One of my favorite places for inspiration and great products is Chicky Pop! They carry some really great designer children’s brands and also carry toys and accessories you won’t find anywhere else. The shopping process on their site was really simple and my items came sooner than expected! print was no exception! I love their items because they fit really well and are made from organic cotton. 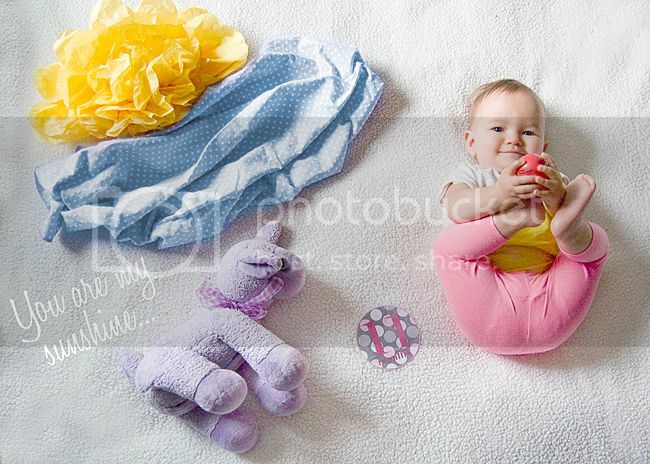 Chicky Pop has tons of Mini Rodini to choose from! I also picked up this adorable plush dude from a brand out of the UK called Corby Tindersticks. His name is Ralph Raddish and he’s super soft and the perfect size for Lark. His tag included his back story and I thought that was a really cute touch. Plus, he looks like he’s wearing a birthday hat, so he was the perfect gift for Lark for her first birthday! Chicky Pop is graciously offering one of my readers a $50 store credit! This is amazing and you’ll have a hard time choosing what to buy if you win! Entering is easy, just follow the steps below for your chance to win! The winner will be announced on Tuesday, September 30. Good Luck!! CONGRATULATIONS SARAH from Macon a Mess!!! This last week was a big one for us. Lark has been working on her standing skills this week too. Finally getting brave enough to stand for longer periods of time. Her balance is awesome, which makes me think walking won’t be too far off! 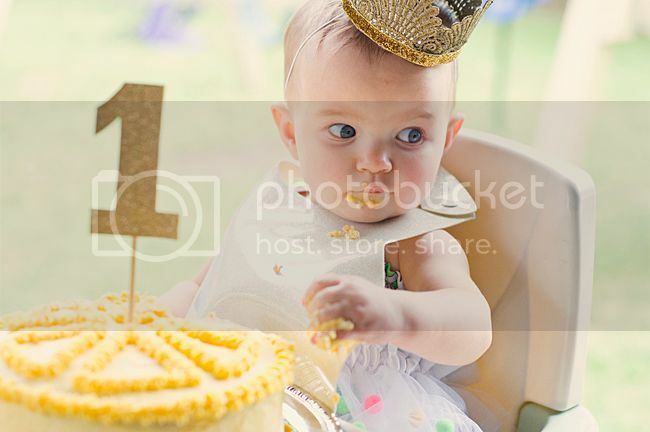 you are one whole year old. 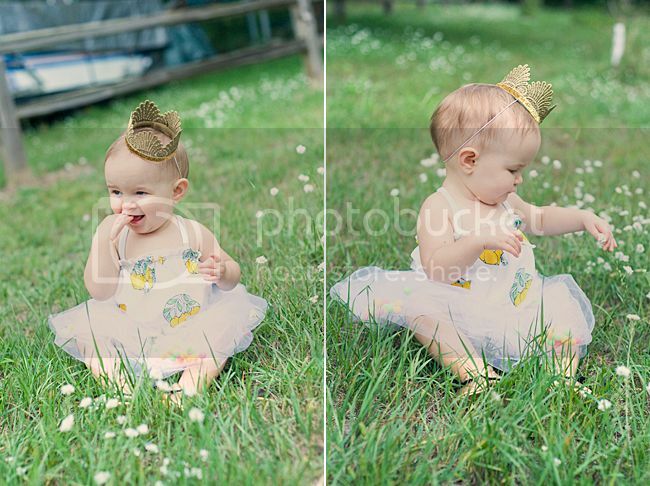 I cannot believe an entire year has passed since you made your way into the world. being a mother, specifically your mother, has been the most beautifully rewarding thing I’ve ever done. I’m so honored and privileged to have you as a daughter. life is a crazy journey, and sometimes i don’t quite know what direction i’m going…then you were born, and like the magnetic pull of the earth, my life’s path started pointing straight to you. we are connected and there’s no breaking the bond. my life’s path has been completely altered by your presence, and my life’s path has never been so clear. we may not know the future, but our future is with you and there’s no other adventure i’d rather be on. you are the happiest and sweetest baby. you have your moments, yes, but you are truly an absolute joy and light in our lives. you are my daughter. my cautious, calculating daughter. a thinker, a planner, a calm, quiet soul. the last year has been challenging, but so beautiful. every moment telling our every little story. the twists and turns slowly weaving a history and slowly weaving your life’s journey. there’s been so much happiness and so much worry. there have been moments where we feared for you. your health was at stake and we couldn’t bear the thought of something happening to you. but we triumphed together and you’re better because of our strong, family bond. you love to laugh and make us laugh. it’s like you’re already forming your own dry sense of humor. and you understand so much. we try and tell you everything, talking you through all that we do so you can learn and absorb the world around you. this world that’s yours. you’re always pointing, with a look of absolute wonder on your face. i’m experiencing everything again through your eyes and it’s so beyond amazing. colors are brighter, sounds are clearer and your sparkle when you discover something new is like a drug, an addiction and gives me the purest rush of adrenaline i’ve ever felt. we love hearing you say mama and dada, kitty or keesh as it sounds from your mouth, bubbye and even donald duck, which you learned from your favorite, mickey mouse clubhouse. you’ve got pearly whites shining bright in that little mouth and you’re on the move everywhere and are very close to standing and maybe, just maybe, walking. we watch you grow strong and healthy, all the while staying our tiny, petite, little bird. i’ll never forget the moment i saw you. i’ll never forget the moment i fell in love. i hope you’ll always see how much i love your father. he’s amazing and you look so much like him, right down to those enchanting blue eyes. seeing him with you rattles me, it shocks me to the core, and it feels so good to see that you have a loving and committed dad, who was there every step of the way. the day you were born was also the day your daddy asked me to be his wife. it was a long and hard day, but the i soaked it all in, taking mental notes of how i felt, riding the waves of pain, and knowing that in the end, my life will be different, in the best way possible. every day is new, and every day is another chance to learn more about this being we created. this beautiful creature who continues to amaze us every day. every glance into your blue eyes pierces my soul. i love you so much, it hurts. it’s excruciating, physical and mental pain to be a mother. to love this much, feel this much, and care this much honestly and truly hurts. but it’s the most amazing kind of pain, the kind that makes you feel alive, the kind that makes you keep going. i always wanted to be a mother, and it’s so much more than i could have ever imagined. when you lay that little head on my shoulder after a long day, my entire body feels like it might spontaneously combust. and just when you think you can’t possibly love more, you do. celebrating your birth was amazing. reliving every moment of the past year, and imagining all that’s to come. seeing the love and support of those around you has us so grateful. you, my child, are loved beyond measure. i wish you all the happiness in the world. a world with a lot of sadness, but there’s light there, you just have to keep your head up and know that we are there to help you every step of the way. you’re brighter than sunshine and your future is so good, i can feel it. your little lark story continues and my heart follows wherever you go. You are 9 months and 3/4 of a year old!! Time is passing so quickly these days, I can’t believe it. You’re saying ‘mama’ a lot, and in the right context. Sometimes it’s still ‘mamamama,’ but it’s definitely directed at me! I really do love it. Your daddy took you to your first book reading at Barnes & Noble. You got to hear “Oh, the place you’ll go…” by Dr. Seuss. Dad couldn’t leave without buying a copy of the book for you. We celebrated our first ‘official’ Mother’s Day. I love being your mama and am happy to celebrate any moment of any day! We spent the day together and went out for dinner. The power went out at the restaurant so we had to go elsewhere! Not sure why that matters, but mama just likes to remember details. Being your mama is still the best thing ever. It’s hard work sometimes, but so beyond worth it to see your face every day. We also celebrated Memorial Day weekend up north, of course. You got to hang out with your cousins and your cousin Lucas has surpassed you in weight! Almost 3 months younger, but he’s bigger than you! You loved swinging on the swingset with Audrey and Ayden. And mama asked Aunt Trista and your cousins to be in the wedding! You’ve also been a bit fussier as of late, and are having some trouble going to bed at night. You want nothing to do with it AT ALL. You used to be the easiest kid when it came to sleep. We could lay you down and you’d go right to sleep. Nowadays, it’s a bit different. You throw fits and just fight sleep all together. Mama doesn’t know what to do sometimes. I sing about 157 renditions of ‘twinkle, twinkle little Lark’ every night, and let you cry a bit until you’ve exhausted yourself to the point of sleep. Lots of people suggest teething, but we’ve thought you were teething a hundred times before and you still have no sign of teeth. Mama also read about 9 month sleep regression, which is pretty common, and I think maybe you have a touch of that going on too…I hope we can iron out these kinks soon, you (and I) are tired. You’ve been waking up a bit during the night as well, which isn’t typical of you for some time. You’re not into feeding yourself yet, but we are trying! We also started trying a sippy cup, but you aren’t very keen on it. You like to go shopping with mama and take walks with mama and daddy. 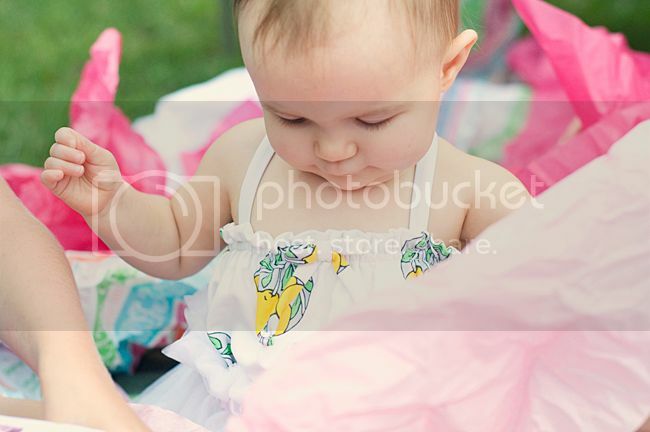 You also love to hold our hands and ‘jump.’ It’s so precious! We just love you so much! 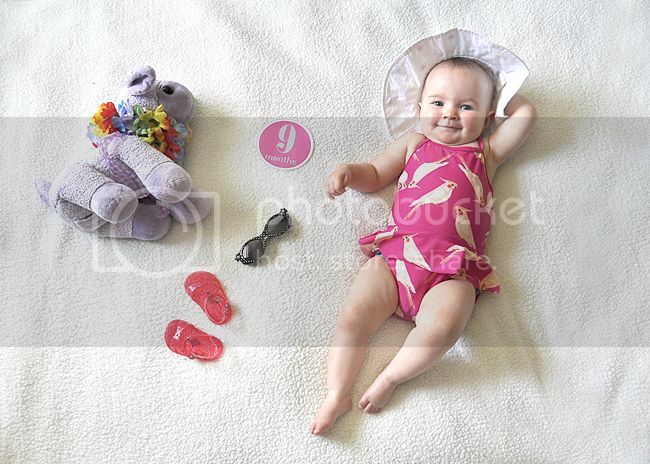 You’re ten months old and nearing that ONE year mark very fast!! Your biggest accomplishment this month is that at 9 months and 3 days, you FINALLY took off crawling! After months of being so hesitant about it and content to sit in one spot, you hauled off after one of the kitties one morning before work. You’d moved a little bit at times previously, but this was the first time you REALLY took off! The cats learned how to run pretty fast! Although, Albert has a bit of a rough time adjusting to you and has been a bit aggressive. You’ve had some scratches and it makes mama so sad! You also went to the doctor for your 9 month check up and weighed 15lbs 15.9oz. Not quite 16 lbs! You’re still little and fit into 3/6 and 6 month clothes. Still trying to encourage self-feeding as well, but you’re still not quite into it. But you will feed us bites if we ask for one, so you definitely know how, you’re just taking full advantage of being fed…and you don’t quite understand taking bites off of larger things like animal crackers and you get so mad when a piece doesn’t automatically break off! But you still have no teeth, so that is part of the problem. You can point out the kitty and the duck in your animal book. You’re so smart! Sleep is still a problem lately. You’re sleeping through the night, have been for awhile now and have always been a good sleeper, but getting you to sleep has been the problem. You throw ‘fits of rage’ as mama likes to call them when going to bed. We’re not sure what’s happening, but we feel like maybe it’s a combination of teething (which we’ve said a million times before and no teeth!) or the 9 month sleep regression mama’s been hearing about. Either way, it’s frustrating for you and for me and I wish there was an easy fix. You used to lay down and fall asleep just fine. Mama still sings “Twinkle, twinkle little Lark” over and over again, which helps, but you’re a mess most nights and we’re exhausted! I end up falling asleep with you in your room most nights. You also started swim school and you have absolutely hated it! Which surprised us, because you love baths! You cry the entire time you’re in the pool! You’re very unsure of the water. Mama and daddy takes turns with you in the water. Your classes are two days a week. You made a friend who’s only 5 days younger than you and I’m hoping her love of the water rubs off on you! We took you to the little splash pool to help get you used to the water and we think it’s helping! It’s a shallow pool and you can touch the bottom which makes you feel more secure. You went in your first lake this month too. You were fine with it until a tiny wave got you in the face! We also celebrated Father’s Day and you really do have the best dad ever! We went to eat and went to the park to play. It was such a fun day and I hope your dad knows how much he’s loved by all of us! You’re dancing constantly! And it’s absolutely hysterical! You love to chase and be chased and you laugh and squeal SO loud! It entertains us and cracks up up! You’ve been pulling yourself up on things since well before you crawled, but you’re starting to let go of things and trying to stand on your own. You’re the biggest little girl I know! Your brother got his learner’s permit and it’s crazy how fast he is growing up too. Mama is nervous about him being on the road!! He also left this month to his mom’s house for the summer and I bet you’ll be missing him. He loves to make you laugh. We also celebrated the fourth of July up north and mama was sad it was your last ‘first’ holiday. But we had a fun weekend and watched the parade and hung out with lots of cousins. You met another cousin for the first time, who’s 2 days younger than you. He is standing and trying to walk and we were just amazed by it because you are so very cautious about it! The fireworks didn’t bother you one bit! You love this ball popper at your grandma and grandpa’s house and when it would finish you would say ‘da!’ You did it multiple times and mama discovered you were saying ‘all done!’ It was so funny and awesome! So you now you say mama, dada and all done! We think you’re sometimes trying to say kitty too, but it comes out as ‘tee’ or ‘teesh.’ You’re waving all the time and love waving ‘night, night’ when you go to bed. You’re so sweet and perfect. 11 months old!! I can’t even begin to believe it.You’re so much fun and always have us laughing! Especially when making all sorts of fart noises, which is your favorite! At 10.5 months, you finally got a tooth!!! We felt like you might be toothless forever! You have some others just waiting to burst through. Your sleep has been a bit better as of late, so we’re thinking teeth may have been to blame. You’re less fussy as well, but still such a mama’s girl. You adore your dad, but if I’m in the room, you want to be in my arms. Swim classes continued and you were liking it much better by the time the classes were over! We put you in the shallow water at the stairs first and that seems to help. We ‘ease’ you into the water! Your brother turned 16 this month. SIXTEEN!!! 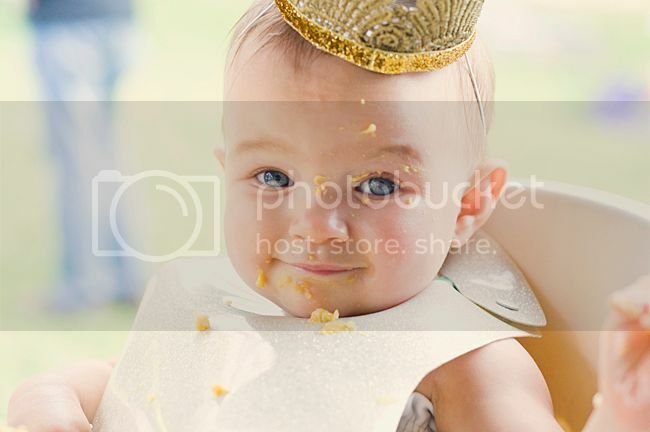 His mom threw him a party and you, daddy, aunt Trista and I were able to go. Brennan’s other little sister just adored you and loved to help me feed you and blow bubbles for you. Mama and daddy went house shopping a lot, and even found a few they wanted, but in the end, the timing wasn’t right. With the wedding and everything else going on, it’s just too much to take one. But we hope to have a house sometime in the near future! We took you to your first baseball game and you had so much fun! The mascot came and played with you for a bit, but that freaked you out completely! There were fireworks after the game and you were pretty excited about those. 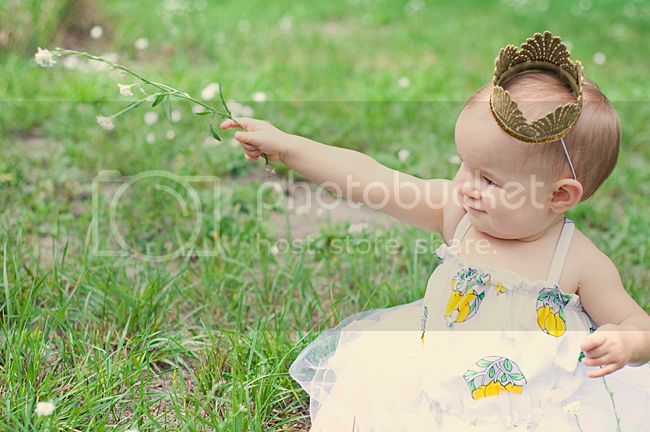 You loved playing in the grass and watching all of the other kids running around. You love to say ‘mama’ when I come get you in the morning. Daddy also loves waking you up in the morning. He sings ‘you are my sunshine’ to you all the time and you just love it! You also love playing with the mail and throwing it EVERYWHERE!! You love throwing everything EVERYWHERE! We love you more than all the stars in the sky. I can’t believe our next update will be 12 months…it’s been a beautiful journey. Last week we celebrated James’ 40th birthday. It was VERY low-key and I’ve been harboring a lot of guilt for not planning a big extravaganza. There’s just so much going on right now! But we spent it together and that’s what counts! We went to dinner at Buffalo Wild Wings, of course. It’s his favorite, after all. Lark had her 12 month check up and all was good. She didn’t get the shots she was due for, because her allergist advised us to wait until he re-evaluates her at the end of this month. Some ingredients in the vaccines are a concern for her health. 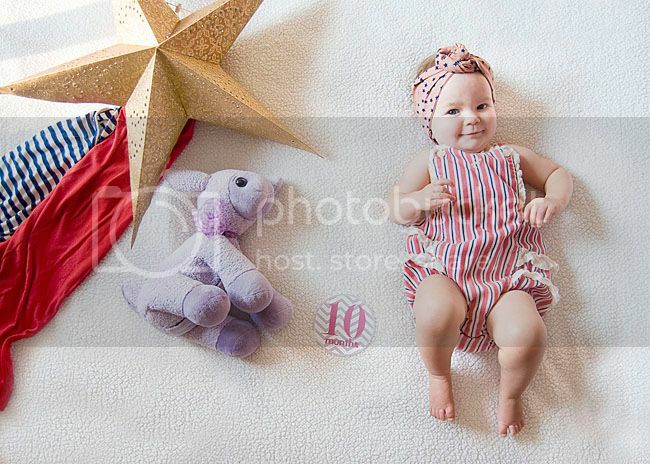 She weight 17lbs 6.6oz…still a tiny tot!! She’s been sick and the doctor confirmed it’s just your standard cold. And she’s passed it on me now!! Wedding Wednesday // Our Invitations! So I missed Wedding Wednesday last week, but I’ve been feeling overwhelmed and have a lot going on…but we’re back at it this week with a special post about our invitations! I designed the invitation myself, with James’ input of course. We didn’t want anything terribly formal, and I wanted things to be a bit whimsical. Overall, I’m really pleased with how they turned out. Assembling them was torture at times, but luckily I only had 50 addresses on my mailing list. Check out the video at the bottom of this post for a more detailed description! 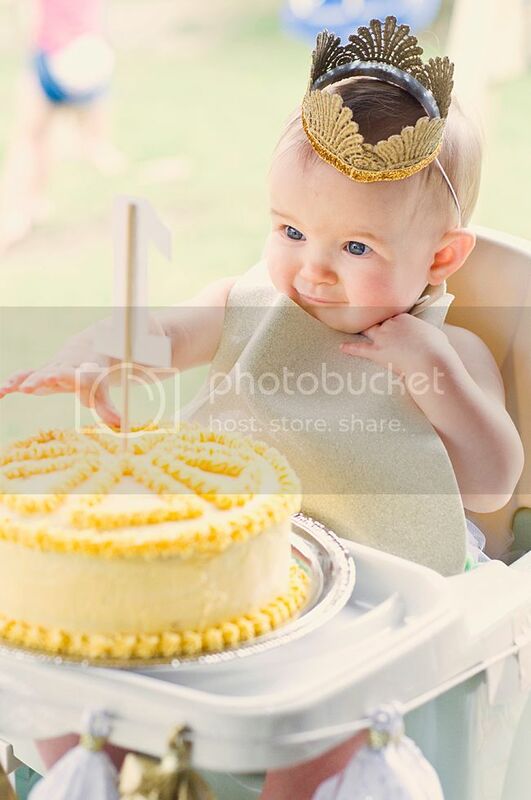 Not much to say about last week except that our baby turned ONE! It’s so surreal. I spent the week/day reliving everything about her birth. Time passes so quickly and they change so much in the first year. I’m so proud of my little bean and can not imagine life without her. She has fit so seamlessly into our world, and us into hers. She hasn’t been feeling well, and every cough and wheeze is still a bit jarring for us, considering her allergy history, but she enjoyed the zoo so much! Especially the prairie dogs! We celebrated later that night with some coconut, dairy-free ice cream. 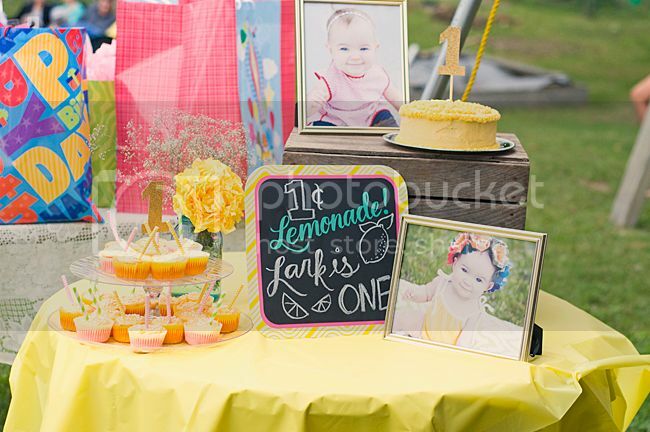 A Lemonade First Birthday Party! 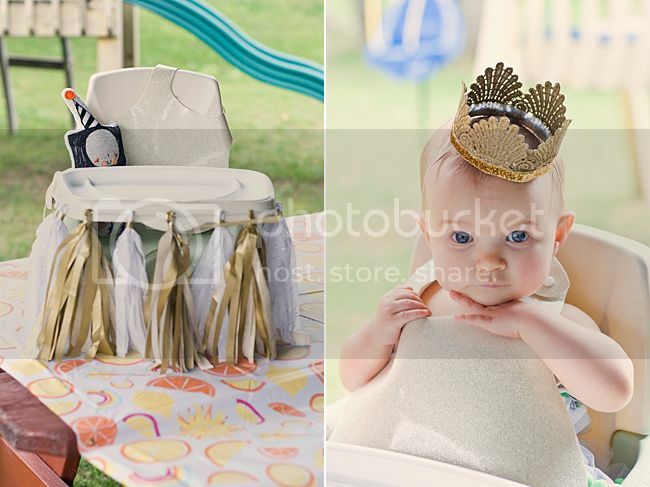 Typically, this would be a standard “week in review” post, but since last week consisted mostly of Lark’s first birthday party, I’ve decided to include it in a party post! (You can see the video at the end of this post)….Also, Wedding Wednesday will be happening on Thursday of this week…Hey, I can only do so much these days! Lark actually turns one on September 7th, but because we would be with family during Labor Day weekend, we decided to throw her party then. I had been stressing and crafting decorations for a few weeks, but the party turned out beautiful. I chose a lemonade theme because…well, I don’t really know why. It was partially inspired by my favorite cupcake recipe for Pink Lemonade Cupcakes, which you can find here. And partially inspired by some summer decor they had floating around at Target earlier in the season. I managed to snag the tablecloths, cups and napkins on clearance! 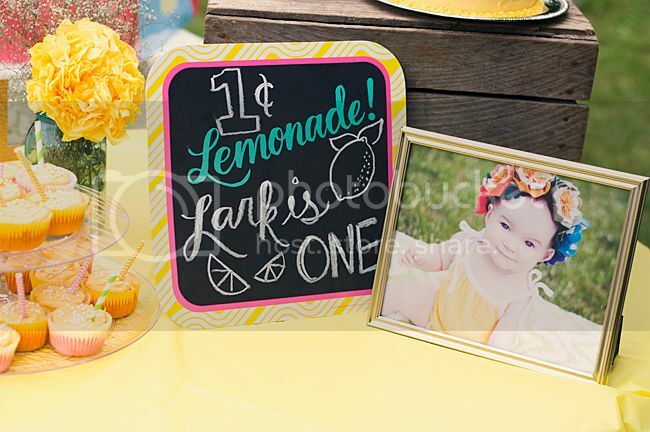 The lemonade sign was also on clearance! I can’t remember exactly how much I paid, but everything was about $2-$4. 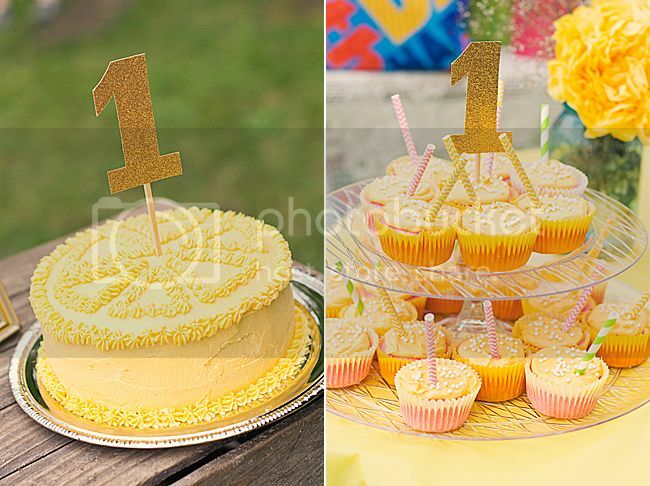 The cupcake display was a DIY project using two dollar store plastic trays, a dollar store candle holder and some poster putty. It was perfect and really cute! Lark’s was actually vegan. 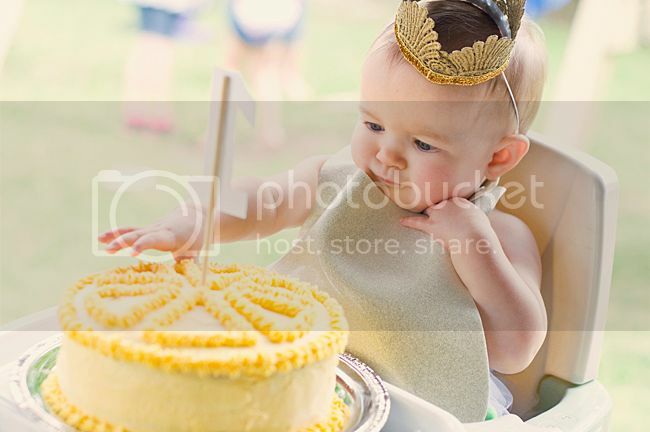 She has both milk and egg allergies and I was sad that she may not get a real birthday cake! Until I found a recipe for a vegan vanilla cake, which you can find here. It was actually REALLY good, but very heavy and dense. But it baked nice and fluffy! The frosting was a bit hard to pipe, because it’s consistency was a bit different. I piped wedge shapes on top to mimic a lemon. I hand cut two number ones out of glitter card stock, and secured them to a skewer with hot glue. One for her cake, and one for the cupcakes. Lark loved it! She had never really had a sugary treat like this before, since she can’t eat your typical baked goods. She enjoyed it! She isn’t very keen on feeding herself (we’re working on it) but I did manage to help ‘guide’ her so she could get some bits and pieces off of her hands, which you’ll see in the video. She didn’t make too much of a mess, but I fear she’s learning to hate messy hands like her mother and father! Although, at one point, she rubbed her eyes and smeared cake all over her face. We also decorated the high chair she sat in for the cake. I hung a tassel garland that I made around the tray and bought her a bib from Glitter Bibs on etsy. It was a bit big, but so pretty! Her little stuffed robot birthday friend is from Chicky Pop Shop. We served lemonade, obviously. Pink and traditional, which we put in plastic mason jar pitchers that I got for $1 at Walmart on clearance. 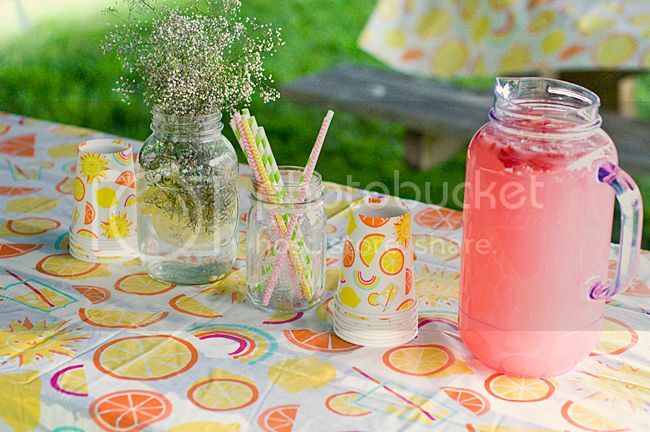 I also put paper straws from Hobby Lobby in mason jars decorated with a twine bow. 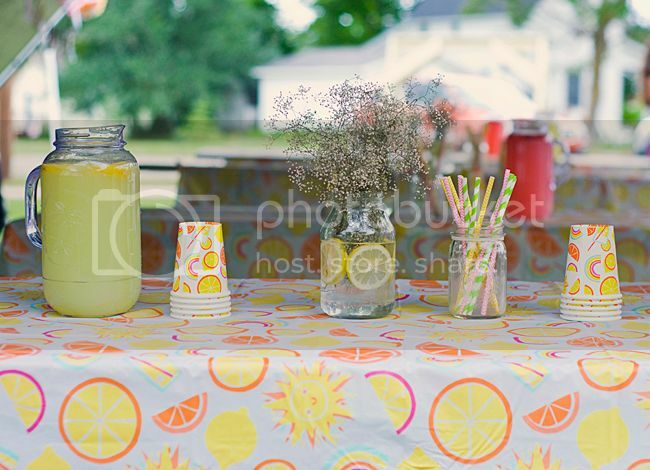 I also used mason jars as vases with Baby’s Breath and lemon slice accents in the water. 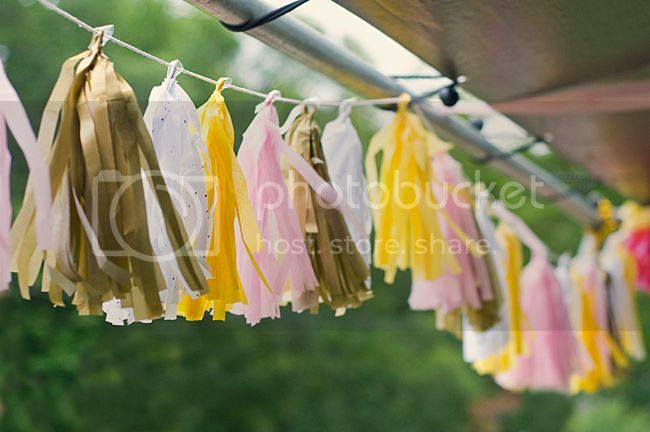 Some of the other decor included a tassel garland I made by hand using tissued paper sheets and lots of floral puffs, also made from tissue paper. I hung some twine and hung photos from pregnancy to now as a ‘timeline’ of her first year using clothespins. I don’t have a good photo of it, but you can see it in the video. 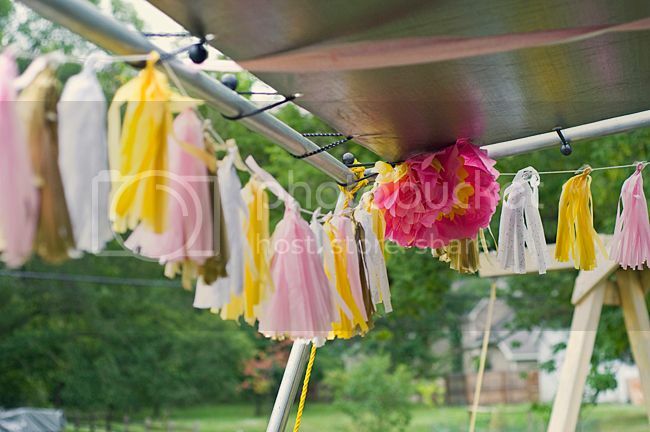 We used a tent that James parents have and also hung streamers across the top and down the posts. 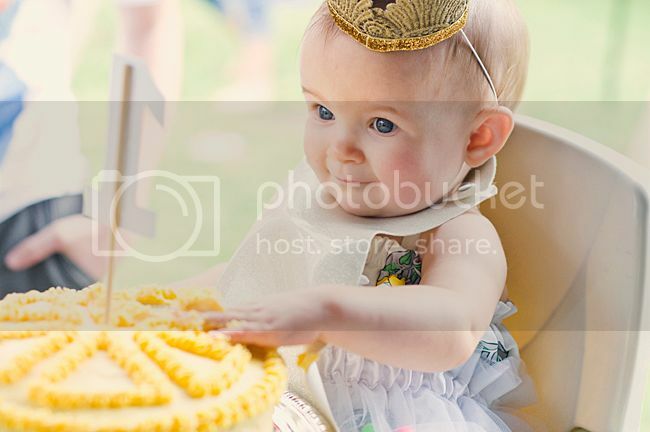 This girl is absolutely worth every minute spent on her little party and the last year has been nothing short of amazing. She’s so smart, funny and sweet. We never get enough of her and I’m so excited to see what her future has in store. Our little Lark Story, you are loved beyond measure. 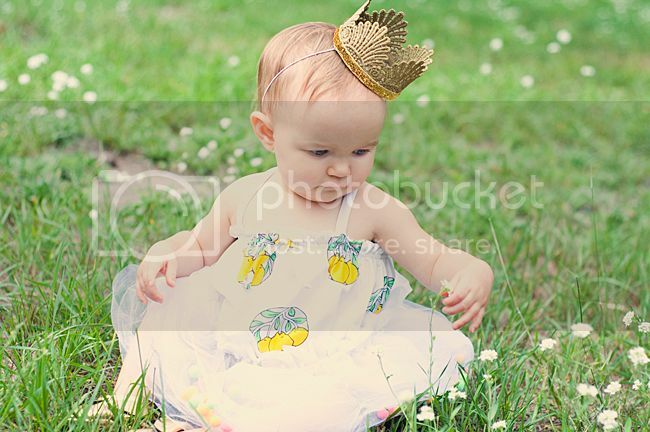 In 4 days, she will be one whole year old. 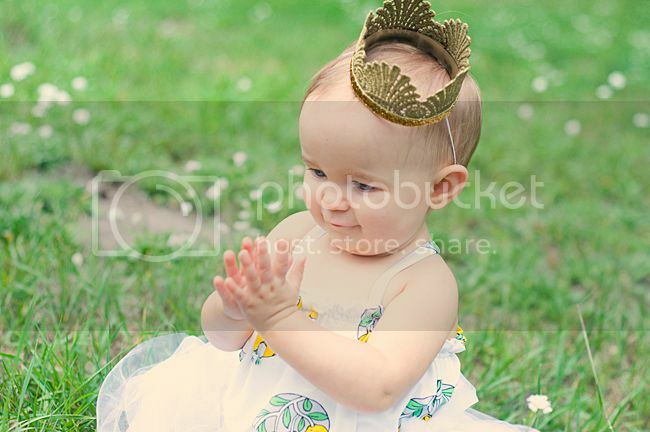 Lark’s outfit consisted of a lemon swimsuit from Gap, a tulle pom pom skirt, made my me, and a tiny, gold crown, also made by me (with some structural help from her dad, uncle and grandpa…if you ask them, they’ll let you know that fits were thrown in its creation. Mama is the WORST perfectionist!) She also rocked some gold moccasins from MyBriellaBo on etsy. And, without further ado, our week in review vlog, featuring the one year celebration of Miss Lark Story!